A new study followed more than 600 women who had abortions over a three-year period to determine whether they regretted terminating their pregnancies. The authors found no evidence of the “post-abortion trauma syndrome” touted by anti-abortion activists, writing that the “overwhelming majority” of women—95 percent—didn’t regret their abortions. Women whose pregnancies had been more planned and who had greater difficulty deciding to seek abortion reported lower levels of decision rightness, as did Latinas. Women both in school and employed at baseline were more likely to report that abortion was right than those neither in school nor employed. Women reporting that the man involved in the pregnancy was not a part of the decision-making process had greater feelings of decision rightness than women whose partners did not want or were not sure if they wanted to terminate the pregnancy. Women in this study overwhelmingly felt that the decision was the right one for them: at all time points over three years, 95% of participants reported abortion was the right decision, with the typical participant having a >99% chance of reporting the abortion decision was right for her. Women also experienced reduced emotional intensity over time: the feelings of relief and happiness experienced shortly after the abortion tended to subside, as did negative emotions. Notably, we found no differences in emotional trajectories or decision rightness between women having earlier versus later procedures. Important to women’s reports were social factors surrounding the pregnancy and termination-seeking. Having had difficulty deciding to terminate the pregnancy, and reporting higher pregnancy planning levels, were strongly associated with negative emotions and lower decision rightness, while being in school and working at the time of the pregnancy was associated with far higher feelings of decision rightness. Community stigma and lower social support were associated with negative emotions. The authors write that there are several ways to mitigate post-abortion regret: counseling, and combating abortion stigma chief among them. Women overwhelmingly felt abortion was the right decision in both the short-term and over three years, and the intensity of emotions and frequency of thinking about the abortion declined over time. Yet high coping and resilience were not observed among all individuals: those with more intended pregnancies and difficulty making the abortion decision experienced poorer emotional outcomes after an abortion. Individualized counseling for women having difficulty with the abortion decision might help improve their emotional welfare over time. Efforts to combat stigma may also support the emotional well-being of women terminating pregnancies. You’ll notice there’s nothing in there about telling women they’re damaged, bad, dirty, broken or “can never make up” for an abortion. Besides Exhale Pro-Voice, there are few neutral counseling options available for women who’ve had abortions. Most, like the Rachel Project, are Christian in nature and predicated on the idea that abortions are psychologically damaging. 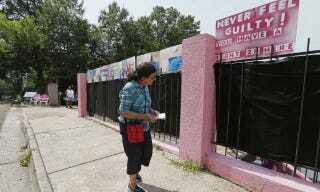 Pam Miller of Pro Life Mississippi, walks along the fence trying to talk to a woman entering the Jackson Women’s Health Organization clinic near downtown Jackson, Miss., Tuesday, June 30, 2015. Image via AP.